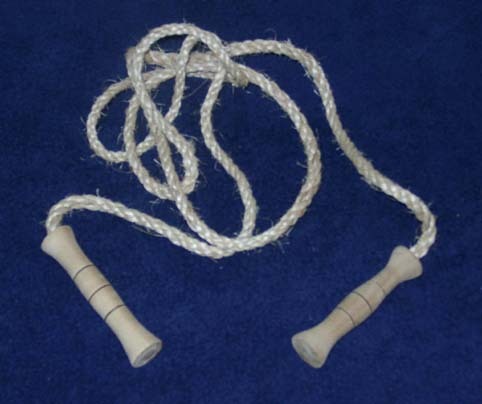 Jumping rope was considered to be a proper form of play for both boys and girls. Jumping rope was included in The Boy's Own Book as late as 1855 and was also included in The Girl's Own Book. Jumping rope is also mentioned in the book Village Life in America 1852 - 1872, which is the diary of a young girl, Caroline Cowles Richards. She describes how in 1852 she and another girl, Anna, who was either her sister or her cousin, were taken to a store and, among their other purchases, were allowed to get jumping ropes with handles. We chose this jump rope based upon that description. The rope itself is made of twisted hemp and the wooden handles have holes drilled in them to admit the rope. No bearings are used in the handles to keep the rope from twisting. We feel that this is a close approximation of the rope described in Miss Richards' book. When jumping rope, we feel certain that the children must have had jump rope rhymes to recite. However, to date, none have been documented until years after the civil war. But the search for jump rope rhymes will continue. If anyone discovers a rhyme from the civil war period or earlier, we'd love to know.